As much as any place on our tour this year, Iceland definitely ticks a bucket list box. Which is why I’m so bloody irritated that my nose is dripping like a tap, my eyes are weeping like a Victorian heroine and I can’t stop sneezing. Curse you, body! Still, it’s my first proper bout of illness this year and Iceland already looks pretty spectacular, even through a blizzard of tissues. We landed at Keflavik (I considered starting this post with a rant about the otherwise-well-mannered middle-aged New York gentleman who would NOT keep his elbows inside his seat territory on the plane but that would’ve been a bit of a downer) and arrived without incident. Or should I say that a certain Yankee was lucky to arrive without me stabbing him in the fleshy upper-arm with my pen. First impression of Iceland was wow. I bet this is how Captain Kirk washes and dries his hands. That’s right – the tap is in the middle and there’s one dryer for each hand. These people are living in whatever comes beyond the first world. On top of this, the sink was in the cubicle with the toilet and the cubicle was HUGE. This is important because, as a female who has traveled internationally and also likes to use toilets (which is a freakish combination, to be sure), I have frequently been irritated by the fact that there is never enough room in the cubicle for my luggage. You can see the issue here when you’re on your own. Ask a stranger to mind it or just leave it outside and hope you haven’t initiated a bomb scare? Iceland, alone out of all the world’s nations, seems to have recognised and overcome this problem. If I knew who to thank I’d kiss them. After I finished marvelling at the plumbing we picked up our rental car, handed back a list of real and imaginary scratches that we shouldn’t be held accountable for (always good to plan ahead) and hit the road. Which is to say, Luke drove extremely cautiously on the opposite side to which we are accustomed and I read the map, in between reusing old tissues I found in my pockets and, to all intents and purposes, crying uncontrollably on one side of my face. Turned out the address we’d been given for our two nights in Reykjavik was, in fact, a half hour drive out of town (and can I just big myself up a little here for being able to spell Reykjavik on the second try without help) and we had no idea how to get there or what the address really meant. Which word was the town? Which word was the street? Why were there two numbers? Why couldn’t we pronounce anything on the map? We solved this dilemma by stopping at a petrol station and the fellow there sold us $6 sandwiches and gave us a one page, much easier to follow, map and explained where to go. Which led us, through a series of unexpectedly correct choices, to our hotel in a tiny little town somewhere in Iceland. Right now we’re planning what we’re going to do tomorrow – we’re on a self-drive holiday that allows two nights here so we can explore Reykjavik for a day then we’re off driving around the countryside for 6 days. 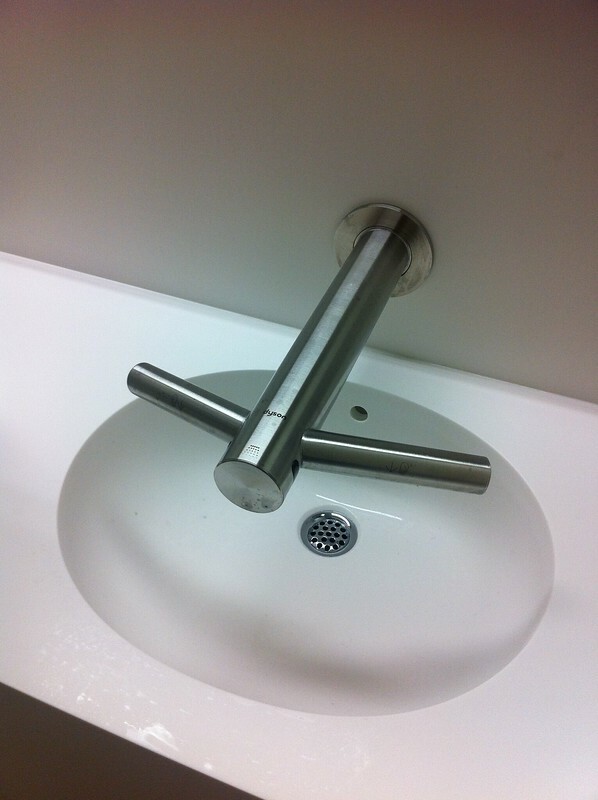 And all you’re getting today is a picture of a tap. It was a great tap though, I promise!